Glamorous and boldly unconventional, "La Lola" attracted an enthusiastic following based more on her persona and her beauty than on her talent. 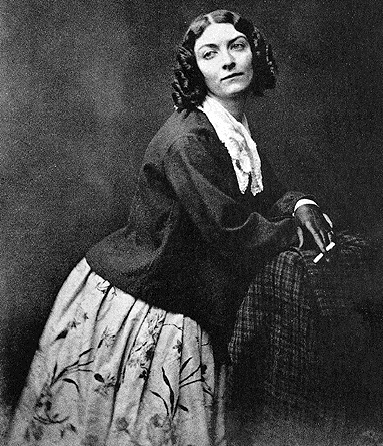 The appearances of Lola Montez are probably the single most-written-about theatrical events of the 1850s. While her talents as a danseuse were questionable, she gave San Franciscans something to talk about. Her legend concerns her tempestuous personality, her habit of horsewhipping critics who did not respond to her art, and her assorted affairs and marriages, one of which took place at Mission Dolores. A sizzling affair with King Ludwig I of Bavaria clinched her fame. Unmusical to a pronounced degree, she was famous for the "Spider Dance." Set to the music of a tarantella (an Southern Italian folk dance in 6/8 time), it represented a young woman being attacked by spiders and her effort to chase them off. She was often the subject of lampoons by other performers in the city, especially actress Caroline Chapman, who found success in her takeoffs on Lola's "Spider Dance." Montez lived for a brief time in Grass Valley, pursuing a quieter life surrounded by her animals, including a bear who followed her about on a leash. While there, she took under her tutelage a young neighbor named Lotta Crabtree, who would become the most popular variety entertainer in America. Montez died at the age of 42 from a stroke and is buried in Brooklyn, New York, under her given name "Eliza Gilbert."